Onions Cry Too – LIVE! Four elderly gentlemen are trapped in a care home, doors and windows locked with the tea trolley provisions diminishing by the day. What is the point of existing outside these four walls? Under the sporadic and semi-conscious gaze of the mysterious Donald, God-fearing Alfred is stuck in the past, Bertie laments a lost love, and Charles is intent on destroying Slough. Fresh from their double-bill of comedies back at the Pride Fringe, New Attitude Theatre Company are back with a new dark comic drama. Jayne Marshall’s script hits all the marks of care home life adeptly without dwelling on how unhappy as a topic this could be. Developed through NorthWest Playwrights, the politics between the men are spot on from the accusations, confusion and monotony of living within the same four walls, day in, day out. Bob Young plays the mysterious Donald, who spends most of his time in a catatonic state in his wheelchair. From forlornly looking out the window on your entrance to the theatre, he only really comes alive in his moments in the spotlight – literally – spread as they are throughout the play leading the audience to wonder who he is. Second in Donald’s faction is Charles, played by Arthur Bostrom. Bostrom’s talent for comedy is not wasted here as he dispenses some wry one-liners. Charles himself is obviously close to Donald, such is the nature of their push-pull relationship. Charles’ obsession with destroying places on his board game also acts a metaphor for the overall ‘game’ that permeates the play. Stuck in the middle are Eryl Lloyd Parry and David Milne as Alfred and Bertie. Seemingly harmless, both hold deep feelings for loss that they have felt in their lives with some deeply emotional interludes that provide an outside dimension to events in the home. Parry especially stands up to the challenge of his story with some physical mime making his story seem all the more real. Meriel Pym’s design is clever, mimicking the cluttered look of nursing homes whilst retaining the fading and forgotten appearance – indeed, fading memories and forgetfulness are two elements that are carved into the play from the style to the words. The second half of the play runs much faster than the first half, whether this is due to the change in tack or me getting into the story more I’m not sure, but the second half is definitely the stronger of the two once the power games are reaching their conclusion. Overall, it could benefit from a little squeeze to tighten it up slightly; the pacing is a little uneven with a couple of awkward pauses. Ultimately, the twist in this tale isn’t the most original, and is signposted quite early on, however, the execution cannot be faulted, and perhaps the twist in the tale is not the most important part of the story. Thematically a success, perhaps Onions Cry Too is a tale of faith, love and how unfair the game of life really is. 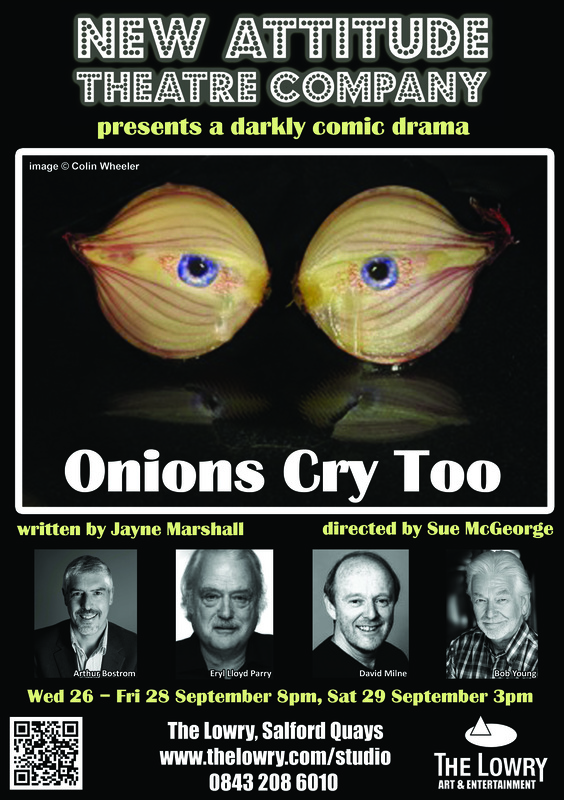 ‘Onions Cry Too’ runs Wednesday 26th Sept to Friday 28th September at 8pm, with a matinee on Saturday 29th September at 3pm. Tickets are £10 (£8 conc), and are available now from The Lowry, Salford Quays: www.TheLowry.com or by calling 0843 208 6010.